The factory plastic charge pipe and diverter valves are prone to leaking under stock boost levels, increasing boost only makes this problem worse. The stock diverter valves are not designed internally to handle added boost pressure. They can fail under load which will actually cause boost bleed off when you don't want it causing boost spikes and loss of horsepower. The STETT Performance N54 135i/335i charge pipe is made from 100% 304 stainless steel and designed to handle higher than stock boost levels without leaking thanks to it's very strong design, ultra high quality materials and our patent pending throttle body connector that forms an ultra tight seal and prevents the charge pipe from blowing off as is so common with other products on the market. The factory plastic piece begins to leak on even stock level boost. 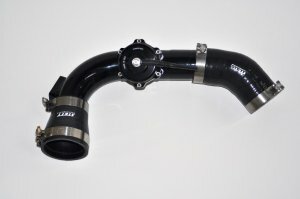 Simply using a standard silicone hose connector to connect an aftermarket pipe leaves a high chance the pipe will blow off the engine. We, however, developed a patent pending 4 ply, double layer hose connector to the throttle body which is far superior to anything else on the market including the factory flimsy o-ring and lock clip. Each kit comes with everything you need for installation including the billet aluminum BOV from Tial, one of the most respected names in the industry. Each pipe comes standard with dual stainless meth bungs.